Everyone knows that Canada is celebrating its 150th anniversary this year. In fact, Canada 150 signs are popping up across provinces, and events are taking place all over the country to celebrate. And one Nova Scotian coffee shop is taking the time to celebrate Canada 150, but also acknowledging the region’s past. Posted two days ago, the photo has now been shared over 2,000 times, and many are thanking the coffee roasters for the display. According to Nova Scotia Archives, the Mi’kmaq were original inhabitants of what’s now called Nova Scotia. Historians have dated the Mi’kmaw history back 13,000 years, which is reflected in the sign. Canadians are loving the tribute, and the response from the public has been flooding in with positivity. 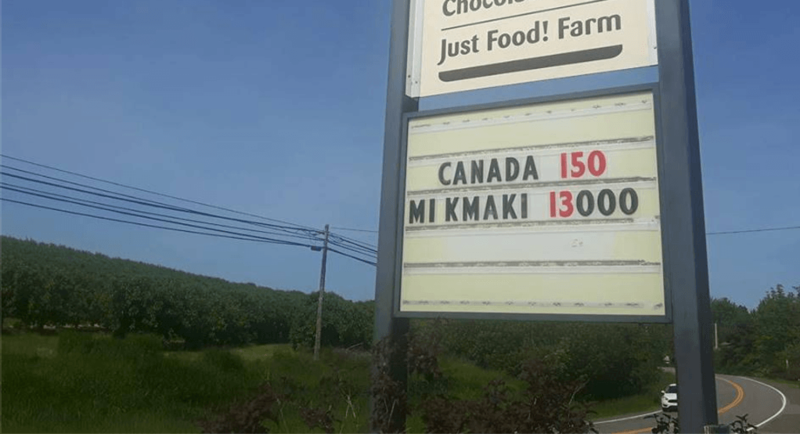 “As a Mi’kmaq, I love this sign,” one person wrote in response to the photo, “well done, Just Us! Just the right nudge to get us thinking and provoke conversation,” wrote another. And it’s true. It really does get you thinking. But that’s Just Us.